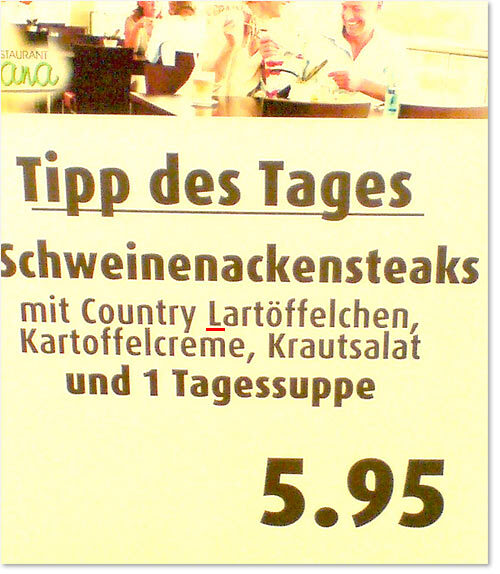 Sich an diese Ermahnung zu halten fällt besonders schwer, wenn ein lustiger Tippfehler auf der Speisekarte den Betrachter in die fantastische Welt der drolligen Country Lartöffelchen entführt. Wer denkt da nicht sofort an einen wackeren Trupp Späh-Lartöffelchen, der mit Rucksäcken aus Krautsalat mutig durch das Unterholz stapft? Der Tippfehler erklärt sich natürlich schnell dadurch, dass die Buchtaben “k” und “l” auf der Tastatur direkte Nachbarn sind. Entdeckt und eingefangen hat die Lartöffelchen unsere liebe Leserin Heike. Vielen Dank dafür. Virtually all of the remarks on this particular blog dont make sense. I have been browsing online more than three hours today, yet I never found any fascinating article like yours. It is beautiful price sufficient for me. In my view, if all webmasters and bloggers made good content material as you probably did, the net will be a lot more useful than ever before. There is noticeably a bundle to understand about this. I assume you created specific nice points in functions also. There are many similar projects that resemble the same laws you acknowledged below. I will keep researching on the topic. You can certainly see your skills in the paintings you write. The arena hopes for more passionate writers like you who are not afraid to mention how they believe. All the time go after your heart. It goes without saying that you did a fine work on this subject. I will look out for more and view your future posts. My partner and I stumbled over here by a different web page and thought I may as well check things out. I like what I see so now i am following you. Look forward to looking into your web page again. Nice content, everything you’re looking for is there. You produced some decent points there. I looked on the net to the issue and identified many people go together with together along with your internet web site.